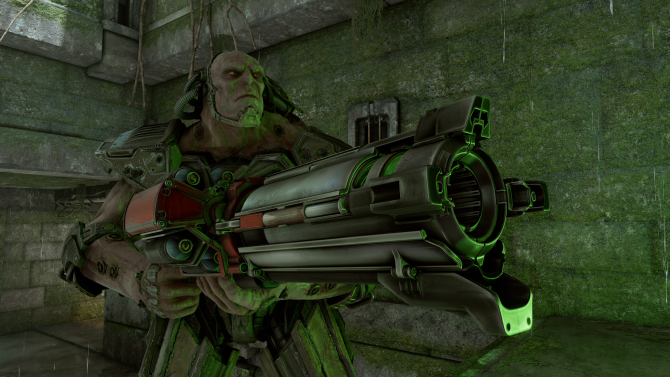 Quake Champions’ April update springs into action today, bringing fresh features and content to the best FPS players in the world. Among the additions - Quake’s quintessential villain, the cybernetic war dog Strogg, joins the fray as a new Champion; a new Cthalha-themed map offers a fresh arena to master; and a blast from the past revives that fragging feeling as the Quake III Arena’s flesh-chewing Plasma Gun returns. Quake Champions is available now in Early Access on Steam and via Bethesda.net. Players can jump in immediately by purchasing the Champions Pack, which unlocks all current and future Champions as well as other exclusive in-game bonuses for only £29.99, or the Scalebearer Pack for £3.99, which comes with two starter Champions, Vanity items, cosmetics and more. A free-to-play version of the game will launch in the future. For additional information, please visit http://www.Quake.com .